The man may be gone, but the legend lives on. 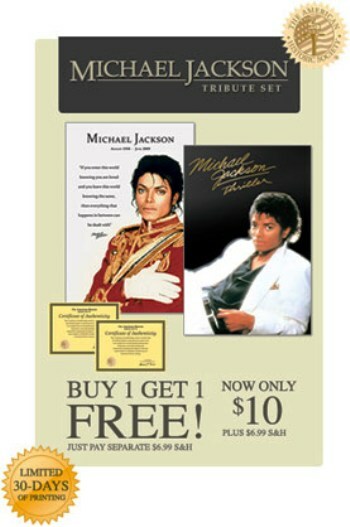 Celebrate Michael Jackson’s life and honor his death with the limited-edition Michael Jackson Tribute Set. Only $10.00, plus $6.99 for shipping and handling. The extraordinary “Thriller Lithograph” is the only Michael Jackson collectible authorized by the American Historic Society and imprinted with the official AHS insignia, and comes complete with an individually numbered certificate of authenticity. This offer is only available through the month of August, so hurry and order yours now. As an added bonus, you will receive a commemorative lithograph showing Michael Jackson in one of his classic regal military jackets and iconic white glove is available for the low price of shipping and handling. Due to limited supply and high demand, no more than two tribute sets per person will be allowed. Lithography (from Greek λίθος – lithos, “stone” + γράφω – graphο, “to write”) is a method for printing using a stone (Lithographic Limestone) or a metal plate with a completely smooth surface. Lithography uses oil or fat and gum arabic to divide the smooth surface into hydrophobic regions which accept the ink, and hydrophilic regions which reject it and thus become the background. previous post: Is That A Wonkette In Your Pocket, Or Are You Just Happy To See Me? next post: Sarah Palin And Todd Palin To Divorce. Allegedly.